It’s been almost two months since I’ve written an entry for my musical journal. That’s because I am in the final stages of editing a novel I’ve been working on full-time for almost a year. It’s a work that is so important to me that one and a half years ago I decided to make a move which would completely change my life: quit my job in the IT department of a large corporation and become a full-time writer. I did that with this novel in mind. I’ve been working on it tirelessly, until it became twice as long as I had originally intended. Now, with the end in sight, I’ve been writing round-the-clock for weeks and it’s still been moving forward painfully slowly. I’m at the end of my rope and there’s still so much work to do. I’m burnt out. I’m exhausted. I’m depressed. I can’t think, I can’t rest and I can barely sleep. I don’t have the energy to work out and I’ve lost my appetite. I drink entirely too much. Every single second is consumed by thoughts related to my novel, its six-hundred page weight pressing on my mind every second of every day as I painstakingly labor on, trying to finish the editing process for the second draft. Nothing else exist. There is room for nothing else and it is absolute torture. You might then rightfully ask why I am putting myself through this. The answer is: because it’s what I love to do. It’s something that I am extremely privileged to be doing. When I dedicated my life to becoming a full-time writer this is exactly what I’ve signed up for. The torture comes with the package and I embrace it. This novel is a story I’ve been developing for years. It’s the book I wanted to write my entire life and now I’m finally close to finishing it. Yes, the pressure is immense but writing is all I would ever want to do. If one day, for some reason, I couldn’t do this anymore my entire world would be shattered. My life would be in shambles. I’d feel like I have lost a part of myself, the biggest part. In fact, this is all speculation, I have no way of knowing how I would feel if one day I could no longer write and I dread even thinking about that. This brings me to the story of today’s record. Though I haven’t had time to devote any attention to writing about it, music has naturally been my trusted companion through these last few weeks. One record, in particular, has been especially close to my heart. That record is Eberhard Weber’s Résumé. As a storyteller, I’m always interested in the dynamic of a narrative. I see stories in life and I detect them in any type of art-form. Résumé has a particularly interesting narrative behind its creation, for it is a story of loss, transformation and adaptation. There is no way I can really play as my left side is still partially debilitated. I tend to put it this way: It’s hardly probable that I will ever get back to my original state. I can’t claim to know what Weber went through when he found out he could never again play the instrument he loves. But I do know the inspiring way in which the distinguished composer managed to cope with his loss. He found a way for his music to continue. For 25 years I was on tour with Jan Garbarek. We always had a sound engineer with us who recorded every concert. I asked him to pull out my unaccompanied soli – Jan likes to have his musicians play on their own in the transitions between the individual pieces. All in all it’s twelve hours of material now, and I would really like to release a selection of it one day. Maybe I’d even play a couple of deep tones or drones with it. I’m really looking forward to this. Two years after the interview, he released Résumé .The record consists of twelve tracks, all developed from his solos and named after the cities in which the particular concert had taken place. Its premise already gives the album a strong identity and a touching story. With the help of drummer Michael DiPasqua and the incomparable Jan Garbarek, Weber’s songs, driven by the deep, contemplative sound of his signature five-string double-bass, become more than just augmented solos: they become stories of their own. The album starts with “Liezen” and continues with “Karslruhe”, two songs which, I feel, would have worked better fused together into a single, more coherent, opening track (my fixation with good opening songs is well-documented on The Music and Myth). Separately, “Liezen” is reduced to merely a short introduction and “Karlsruhe” is forgettable. Both songs do a decent job of establishing the mood of the album but fail to stand on their own as individual compositions. It might seem like I’m nitpicking but I always put a great emphasis on the structure of a record and the narrative which results from the placement of the tracks. “Heidenheim” picks up the pace a little bit with a more “traditional-sounding” bass solo from the man who is known to shun traditional bass solos. The song creates an interesting, lively (at least as far as Weber’s moody compositions go) monologue that is then turned into a fun dialogue when DiPasqua’s drums intervene. This is the moment when the record starts developing a life of its own. “Santiago”” returns to Weber’s characteristic sound, a deeply atmospheric, meditative piece that flows into the memorable “Wolfsburg”, my favorite track off the album mainly because of the incredibly imaginative use of the haunting minimalist piano notes that are in perfect symbiosis with Weber’s masterful bass. “Amsterdam” welcomes Garbarek’s unmistakable saxophone and accentuates the mesmerizing chemistry that these two musicians developed throughout decades of performing together. Garbarek’s sax is soft and dreamy where Weber’s bass is heavy and mysterious. “Marburg” brings a welcomed shift in perspective in a track where the focus in solely on the exquisite bass-playing while “Tubingen” shifts between Weber’s dynamic, metallic vibration and ‘Garbarek’s soothing, familiar melody. The dramatic finish takes us to “Bochum”, a track whose beginning reminds me of the sound of Miles Davis’ Aura (and that always scores points with me). After the aura-like beginning it evolves into something entirely unique and interesting. DiPasqua’s subtle percussion works great on this track, making it one of the best on the album. “Bath” is another excellent composition which highlights the diversity of Weber’s playing while “Lazise” carries on in much the same way. The record closes with “Grenoble”, a song that starts powerfully and then gradually winds down, an interesting occurrence in an ECM record, where the closing tracks sometimes tend to be a bit passive. 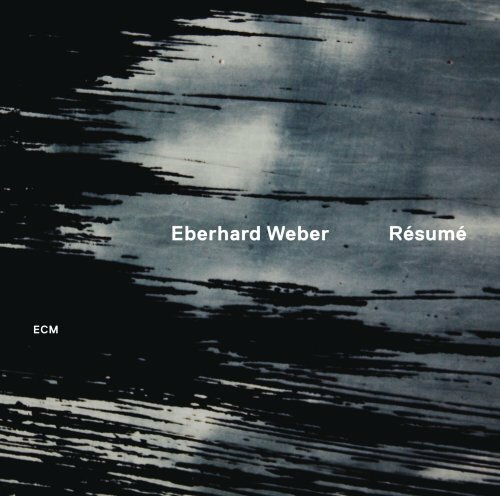 It provides well thought-out closure for Résumé and I can only hope that the twelve hours of solo material mr. Weber has gathered up will lead to more records such as this. Overall, in spite of a lackluster start and the fact that some tracks tend to end a bit abruptly (which is understandable but still undesirable), Résumé is a good record made great by what it represents: a testament to the versatility and undying power of creativity.